In Manhattan Transfer, Dos Passos builds on the successes of Three Soldiers to deliver his first work that is grandly ambitious in both theme and form. The novel paints a panorama of the entirety of New York City—one senses the glow of the neon marquee, the crush of the rush hour crowd, and the night stick of the policeman waiting to push along anyone unsuited for the pace of urban life. Like Fitzgerald’s The Great Gatsby, Manhattan Transfer captures the rhythm of the Jazz Age. But no single dominant character emerges from the heap of strivers in Dos Passos’s world. The standard narrative of the author’s previous works is fragmented in Manhattan Transfer, interspersed with newspaper headlines and song lyrics and aesthetic vignettes. Characters sparkling with hope in one scene quickly lose their luster in another—the city always wins. But Dos Passos infuses the atmosphere with such verve and tenacity that what emerges is a tribute to the myriad toilers who have ever tried to “make it” in New York City. As in Three Soldiers, Dos Passos displays a masterful ear for street vernacular—the precise diction that makes New York City a culture all its own. The author’s strong European sensibilities ideally suit him to record the city’s multitude of immigrant communities. 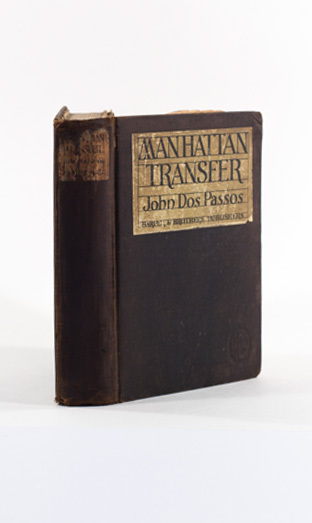 Manhattan Transfer establishes Dos Passos as a writer with the same affinity for describing the city as William Faulkner possesses for describing the country.